You can take a Donkey out of coffee, but you can’t take coffee out of a Donkey. Or something like that. 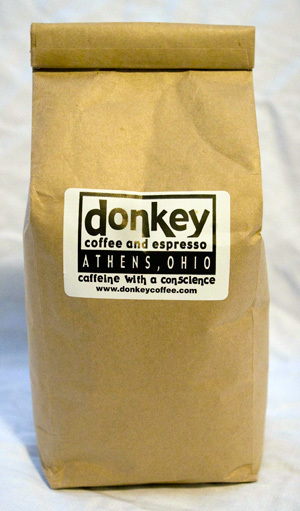 Our 16 oz bags of whole-bean coffee allow you to enjoy the comfort and deliciousness of Donkey Coffee at home! Or, share the love and send a gift. French Sumatran dark roast is from Indonesia and probably the most full-bodied coffee in the world. A deep, earthy brew with moderate acidity and a spicy verve. Our darkest roast, intriguing! Moka Sumatra is light and dark roast blend of dry rich Nicaraguan beans with cocoa undertones and full-bodied Indonesian Sumatran beans. Flavors: House Blend (Marrakesh) and Moka Sumatra. Need a regular Donkey fix? Call us at (740) 594-7353 and we’ll set up weekly or bi-weekly shipments of Donkey Coffee to be delivered straight to your door! I’m in love with your French Sumatran coffee, and now, nothing compares. The Moka Sumatra became my favorite years ago when I first had it and till this day compare every other cup of coffee I have to it….haven’t found anything like it. Best.